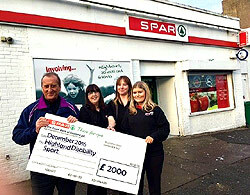 SPAR Thornbush, owned and operated by CJ Lang and Son Limited has recently donated a generous £2,000 to Highland Disability Sport Charity. SPAR Abronhill, owned and operated by CJ Lang and Son Limited has recently donated a generous £1,500 to Redburn School charity. 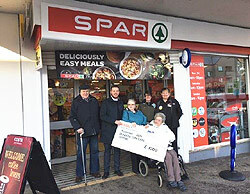 SPAR Thornliebank, owned and operated by CJ Lang and Son Limited has recently donated a generous £1,000 to Rainbow Care Centre. 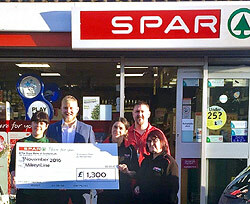 SPAR Montague Road, owned and operated by CJ Lang and Son Limited has recently donated a generous £1,300 to Mikeys Line Fund. 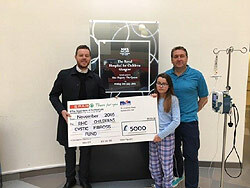 CJ Lang and Son Limited, owners and operators of SPAR Scotland donated a generous cheque for £5,000 to Children’s Cystic Fibrosis Fund.